Every day on my way to work, on the way through the station, I pass a number of disused doorways along a side wall. It has recently come to my attention that one of them has an unexpectedly thrilling sign above it. As a result, I have the following questions, and I will not rest until they are answered. Can I have a go on one? If this is the exit from the Jetfoil, how do I get in? Please answer quickly because I absolutely will not rest until these questions are answered and I am already quite tired. Jetfoil is what they wrap around planes to make them feel all snuggly wuggly after a hard day of working. Ah. Is it like the tinfoil blankets they give people after a marathon? It’s exactly that. The jetfoil gives the exhausted peoples a bit of a boost. When I wrap my lunch in it then it flies around the room. So was this some sort of jetfoil vending kiosk? 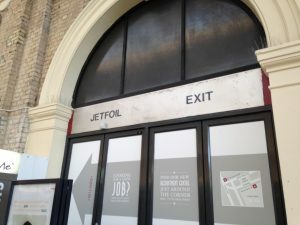 Where people might go in one door, collect a jetfoil from the counter, and then leave through the other door to go and wrap it around their shivering aeroplane? I think it’s the one or the earlier models. These days Jetfoil vending machines are the size of a jelly bean’s toe. That’s pretty small, and also delicious. Indeed. I have to put about thirty into my mouth just to feel good. And it does feel good. It’s like a rainbow vomiting down my throat. I heard that’s the only way you ever feel good these days, and at more or less all other times you’re a hollow shell who knows only the endless all-encompassing need for jelly beans. It’s true. It’s all true. Without my jelly bean addiction I am nothing but a tiny green strawberry floating in a glass of champagne. I thought as much. A thought that I found both poignant and tedious. I quickly dispensed with thinking as much, and moved on to thinking something more enjoyable, namely a daydream about going snowboarding with Chas and Dave. Snowbwoaging with Daz and Chave? I’m so jel/env. Make sure you invite Gary Wilmot because otherwise he’ll get jealous. Wary Gilmot is getting nowhere near. Chav and Dase have hired in some heavy security for the event. Wait, are they the djs or the Cockney singers? I always get the two confused; Stase and Chatus and Chave and Chives. I’m pretty sure Chive and Onion are a nauseating flavour of Pringles, but don’t quote me on it. I heard Clive and Beetroot are worse. Can someone quote me on that?